The Define C is an ATX case that features a highly optimized open air interior design offering room for the most popular component setups. Dense sound dampening material throughout the case in conjunction with Fractal Design’s signature ModuVent™ technology gives users the option for near silent operation or added cooling capacity. The case includes two Dynamic X2 Series fans with bottom, top and front intakes protected by easy-to-clean, high airflow removable dust filters. With extra attention to cable management features such as hidden drive cages and a PSU shroud, the Define C makes it easy to create a stunningly clean build that’s sure to impress. Features • Define Series sound dampening with ModuVent technology for silent operation in a compact full ATX form factor. • Optimized for high airflow and silent computing. • Side and front panels are lined with industrial-grade sound dampening material. • Flexible storage options with room for up to 5 drives. • Comes with two preinstalled Fractal Design Dynamic X2 GP-12 120 mm fans optimized to deliver maximum airflow while still maintaining a low noise level. • Open air designed interior creates an unobstructed airflow path from the front intake to the rear exhaust. • Easy-to-clean high airflow nylon filters on the front and base with full PSU coverage and front access for convenience. • Includes optional top filter to prevent dust buildup when ModuVent is removed for additional fan slots. • Power supply shroud conceals drive cage and excess cabling for an even quieter and cleaner looking interior free of airflow obstructions. 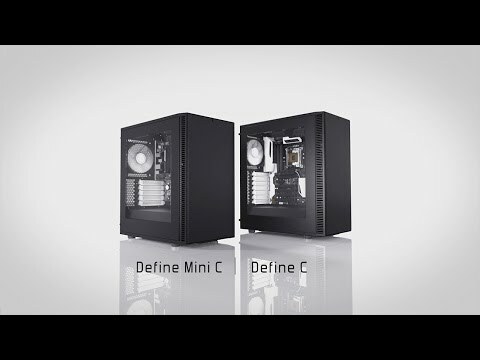 Fractal Design Define C Mid Tower Computer Chassis, ATX/mATX/mITX, with Window, ModuVent Technology, 2x120mm Fans is rated 5.0 out of 5 by 2. Rated 5 out of 5 by BlueOcean from Very compact yet spacious case at a good price I bought this as I was looking for a small enclosure that could fit an ATX mobo, even though mine at the moment is mATX. Quite a few cases fit this bill such as the NZXT S340 and Corsair 400C, but the Fractal is smaller than both of those, and with arguably superior cable management (according to reviews). My only minor niggles are a rattly window panel, and the fact that it would have been nice if there were SSD mounts on the power supply shroud. Other than that, the case is a joy to build in, fits large radiators, and has easy cable management, but has no excess wasted space. My 980Ti fits in there with the Kraken X62 mounted to the front with no problems, but be aware that if your card is very long, you might not be able to front-mount a watercooler. Rated 5 out of 5 by tisho1012 from Fractal all the way! I've bought this case because my previous one(Phanteks Eclipse P400S) have CPU clearance limit 160mm, wasn't able to swap the Noctuna's NH-D15S default fan with Be Quiet SW3 140mm. I was a bit worry because the case is too short and that could be a cooling issuefor the GPU, but I found out that there isn't such an issue though! Another reason I went for this case is, I am not really keen with the water coolers and I am proper air cooling fan, don't want to deal with leaks, pump noise and all that... That case is perfect for air cooling systems, could be a bit too tidy if you want to water cool it, but that isn't my problem though :) There is a SSD mounting bracket, behind the motherboard, fitting 3x 2.5 inch drives, and a hard drive cage of the front under the PSU shroud, which I removed immediately because the 2.5inch tray is more than enough for me, moreover when the drive cage is off there is plenty of space for cable management and you can put bigger PSU's without worry of the size of it!The quality is Superb! The back panel seems to be bulletproof, cable management is superb too, no complains whatsoever! Currently running it with i7 6700K/NH-D15S+ 2x Be Quet! SW3 1600rpm ones, EVGA GTX 1080 FTW and there is a room to fit this card with the EVGA LINK if you have one! The temperatures are good as well, the GPU runs while gaming at 71-74 degrees, some times could get to 75 with roughly 53-55% fan speed, also I am using 2 intakes 140mm Be Quiet! SW3-1000rpm and one 120mm Be Quiet! SW3 1450rpm as exhaust. Well, this is my opinion about it... It is perfect case if you don't want to water cool, but you want decent cooling for your components, or else you don't want a massive case that will take a lot of space on your desk, and as well you want a sturdy case that could last several builds! Totally recommended from me! Cheers to scan for the fast shipment as usual!